Botanical Name: 1. Typhonium giganteum Engl. (Fam. Araceae); 2. Aconitum coreanum (Levl.) Raip. (Fam.Ranunculaceae). Common Name: Typhonus, Typhonium tuber, Giant typhonium rhizome. Source of Earliest Record: Zhongyao Zhi. Part Used & Method for Pharmaceutical Preparations: The tuberous rhizomes are dug in autumn. After the fibrous roots and bark have been removed, the rhizomes are steamed with sulphur once or twice. Then they are dried in the sun and cut into slices. Properties & Taste: Pungent, sweet, warm and toxic. Functions: 1. To dry dampness and resolve phlegm; 2. To dispel wind and stop spasms; 3. To release toxins and disperse nodules. 1. Excessive wind-phlegm manifested as spasms, convulsions and facial paralysis. 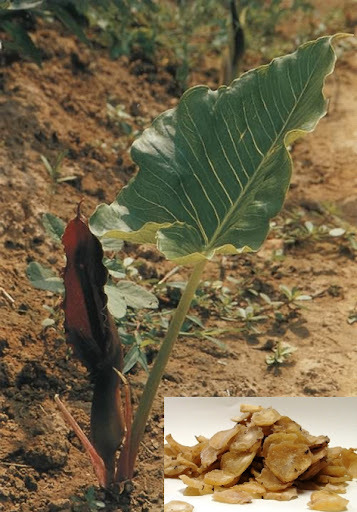 Typhonium tuber (Baifuzi) is used with Arisaema tuber (Tiannanxing), Gastrodia tuber (Tianma), Pinellia tuber (Banxia) and Scorpion (Quanxie). 2. Convulsions and spasms in tetanus. Typhonium tuber (Baifuzi) is used with Gastrodia tuber (Tianma), Arisaema tuber (Tiannanxing) and Ledebouriella (Fangfeng). 3. One-sided headache (migraine). Typhonium tuber (Baifuzi) is used with Chuanxiong rhizome (Chuanxiong) and Dahurian Angelica root (Baizhi). Dosage: 3-5 g, decocted in water for an oral dose. Proper amount for external use. Cautions & Contraindications: It is contraindicated during pregnancy. The crude herb is usually not used for oral administration.